The best ideas are often the simplest, and so it is with this cable lockout. 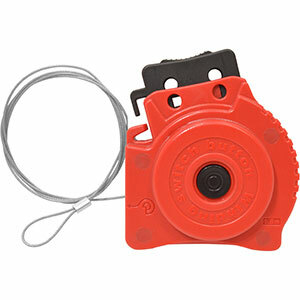 To lockout equipment, simply pull the cable from the interior reel, loop it around the equipment then attach it to a hook on itself and lock it securely. For added security, it has room for two separate padlocks, meaning that two separate people are needed to bring equipment back into service.